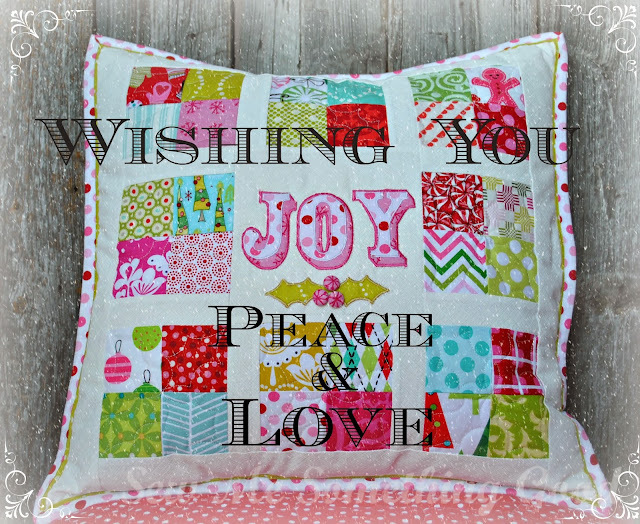 Enjoy the season with your loved ones! I used cash register paper as the foundation for sewing my scraps into the borders that frame the embroidery. Thanks, Maja! Anyways, I realized I was happy with only a scrappy border framing the embroidery, so I went ahead and used some 12wt quilting thread to quilt wavy lines through the borders. 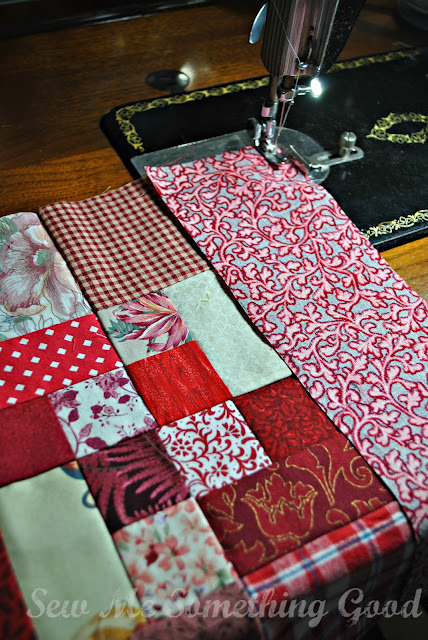 It's a nice change up to use the heavier weight thread for quilting. Having the thread show up adds a little substance to the borders. Then, feeling like my project still needed something... 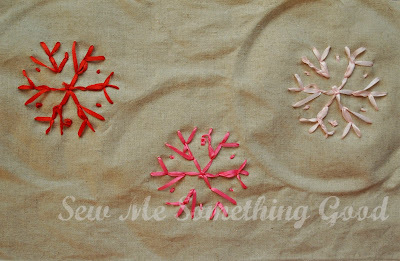 I came up with adding sequins and beads to represent some sparkly snowflakes in the background (also works to anchor the embroidery piece to the batting and backing fabric). 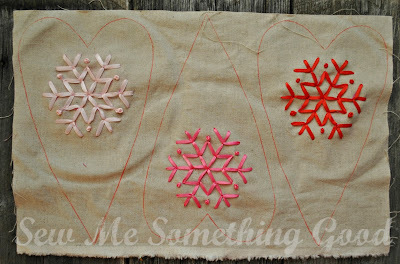 Did you notice that the beads in the "snowflakes" are pink, too? A fun detail that makes me smile. Love, love, love the rough texture of this piece of thrifted linen. Wish I had more of it! 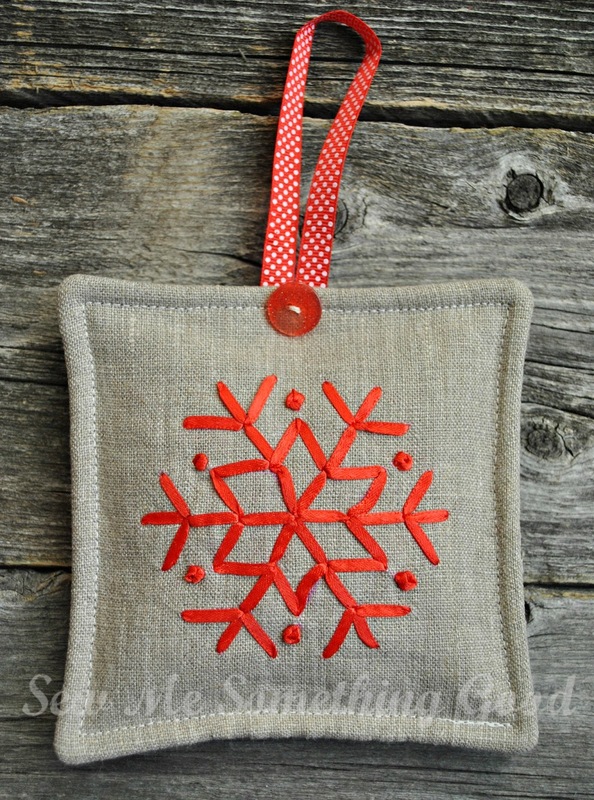 Look how the addition of those sequins gives just a bit of sparkle. Winter does have it's beauty, doesn't it? 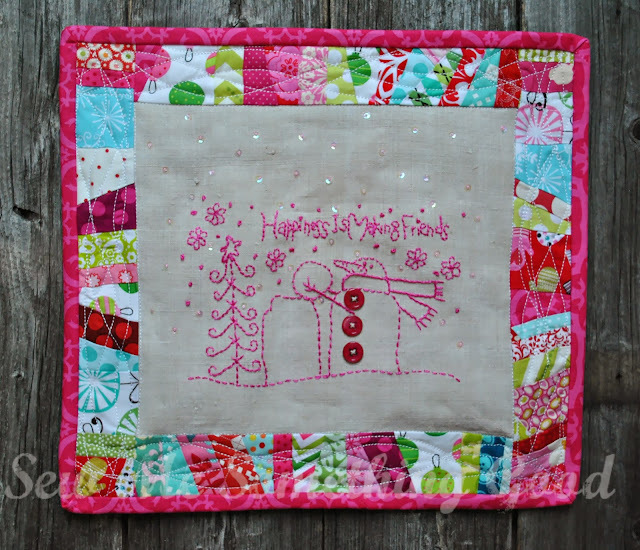 Bright fabrics, linen, a snowman and some cute stitchery. My favourites! Wishing you time enjoying your favourites this weekend! 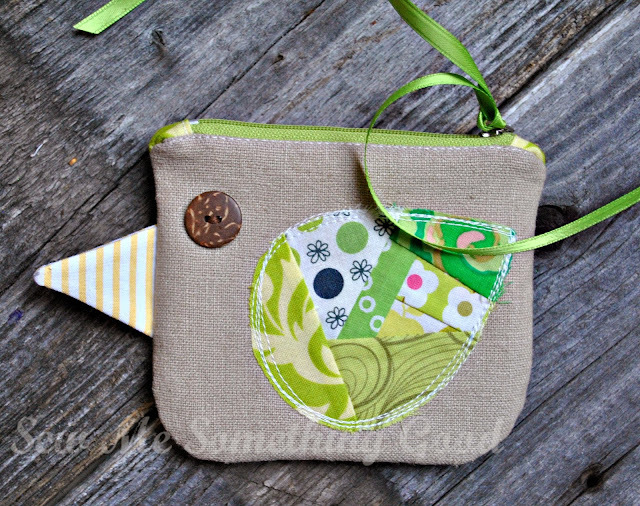 The introduction to Amy's Kotori (little bird) zipper pouch pattern in Zakka Handmades, mentioned it may be hard to sew only one. 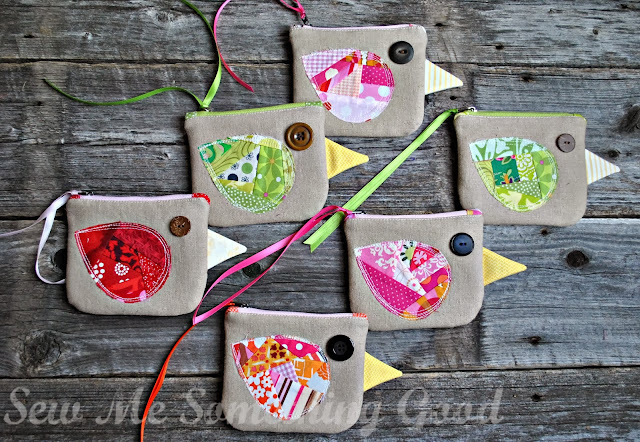 and led to me sewing 6 more. 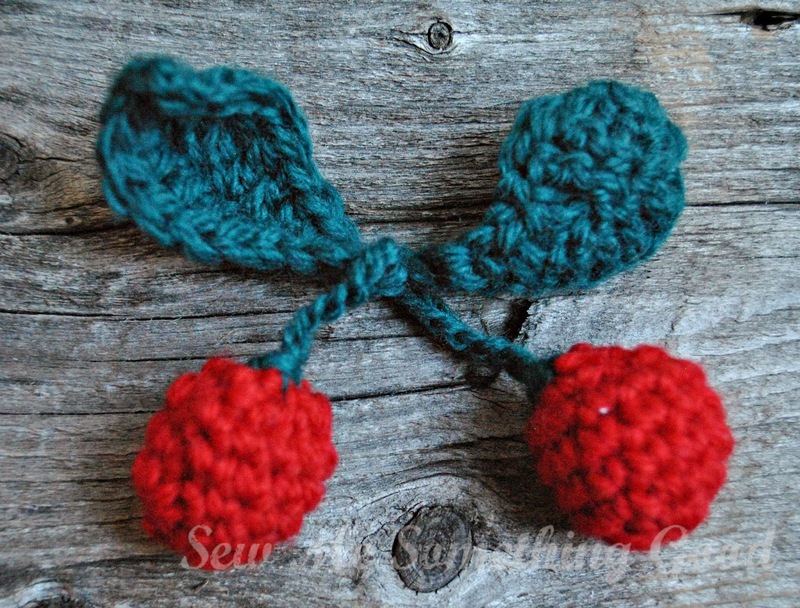 or that they are quick and simple to make. 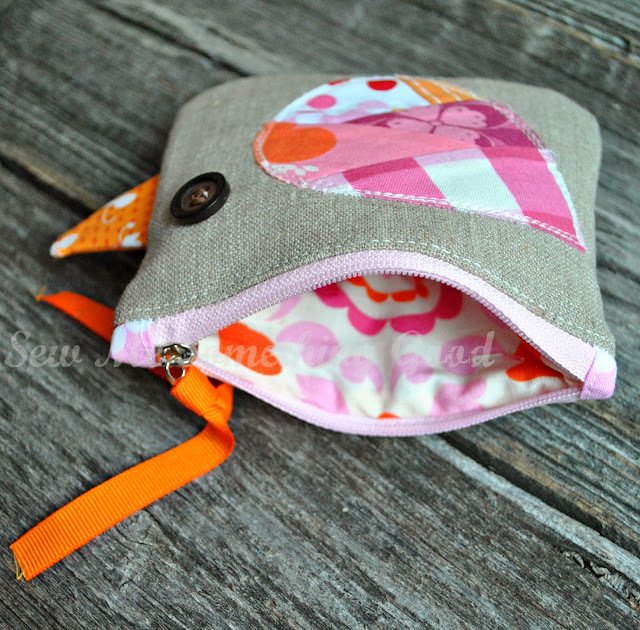 Whatever the reason, I couldn't resist sewing a little flock of adorable Kotori pouches! 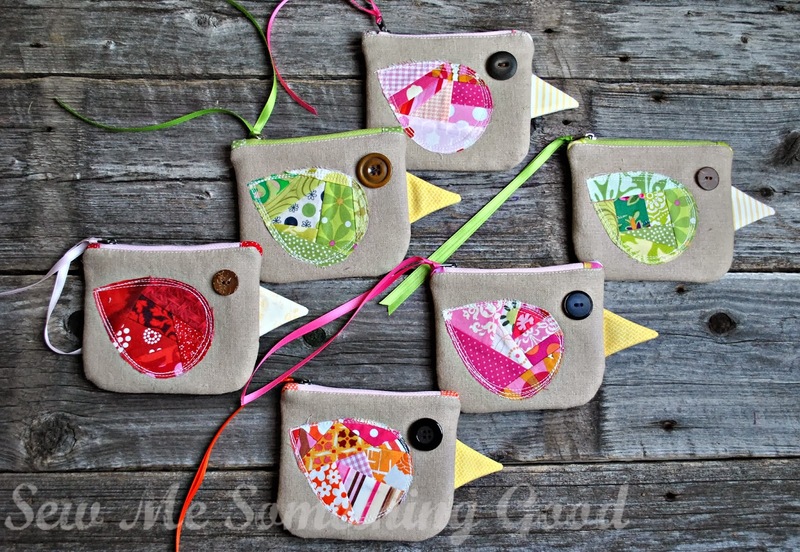 Once these have flown away to their new owners, I may have to sew another flock. P.S. 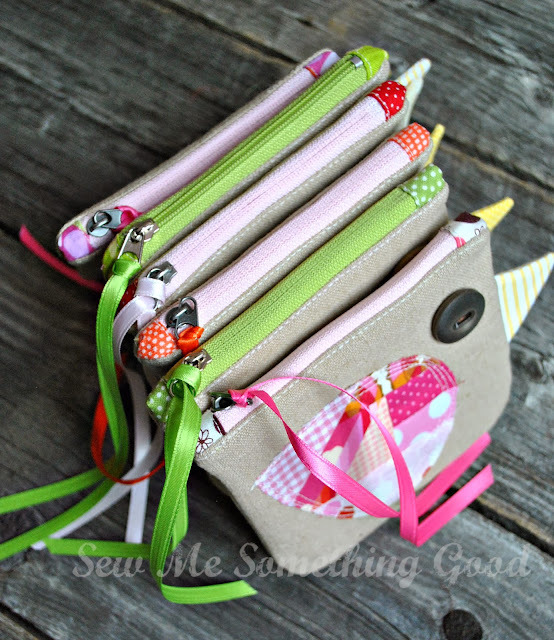 With some encouragement, I've decided to add my lovely flock of Kotori pouches to the scrap challenge for December being hosted by my friend, Maria of Maja's Paradis. Thank you to everyone that participated in my little giveaway. I've enjoyed reading your comments about how long you've been sewing. 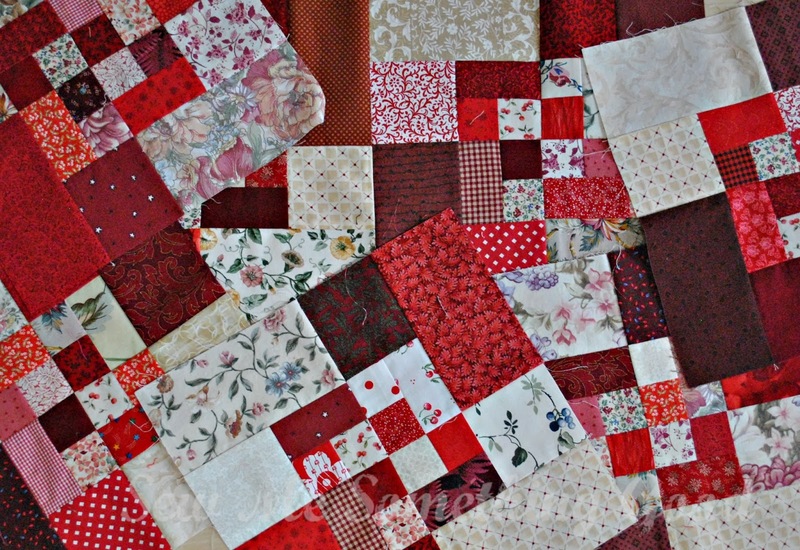 Such an amazing diversity in the length of time - several ladies that have been sewing for over 50 years (someone past 60 years, too!) 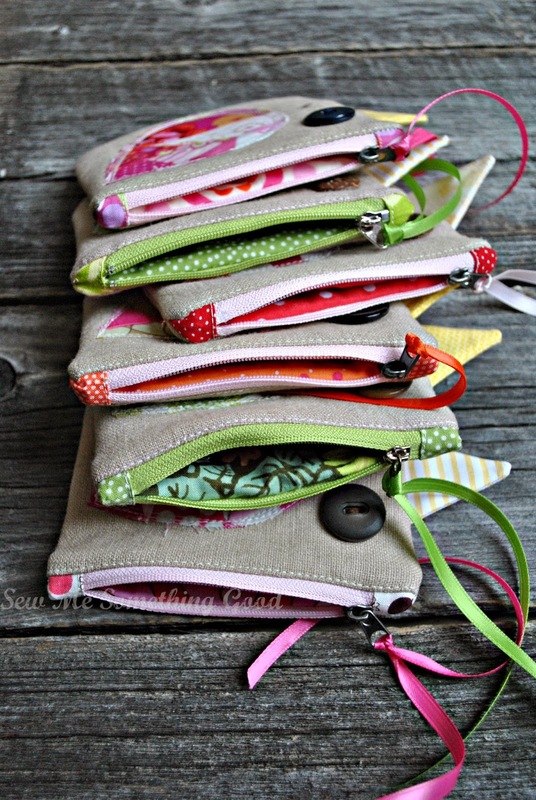 - which is so wonderful and a few that have been sewing for less than a year (hooray!). How great it is that we have all found something to enjoy and even better, that we can share and learn from one another. 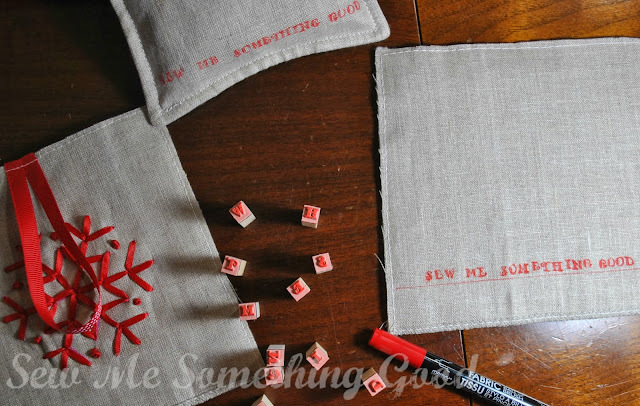 Since you asked...like many of you, I too, am amazed when I add up all the years since I first picked up a needle and thread. 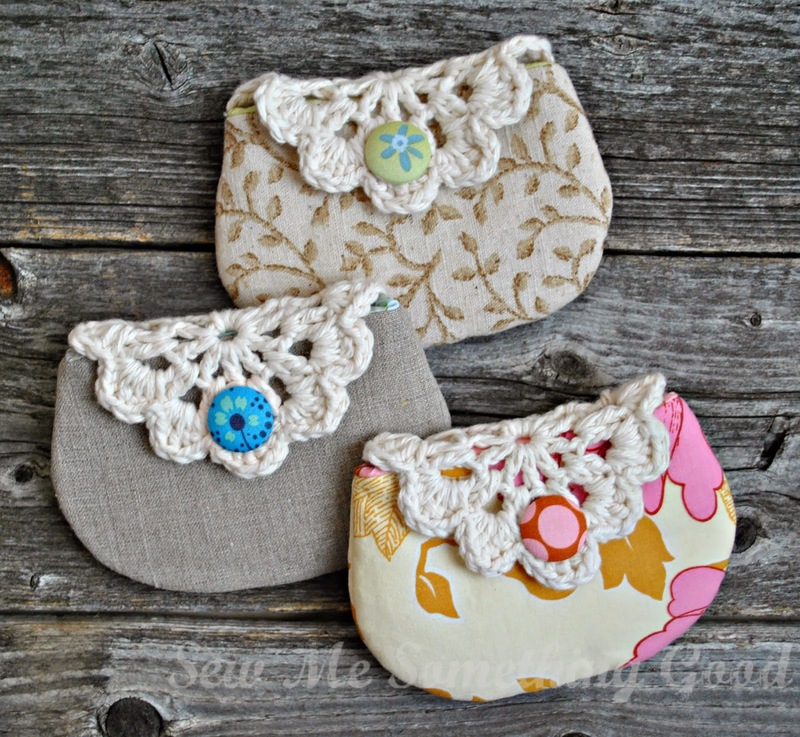 It has been more than 30 years ago since I first learned to sew from my great-grandmother. I knew by the time I was 10 years old, that sewing was more than a passing fancy, I felt that it was something I was meant to do. I still feel that way and I'm so happy to have found others that enjoy sewing as much as I do! *To keep things fair (with every commenter receiving only one entry), I eliminated repeat comments or double entries, which means that the 36th commenter is Angela! 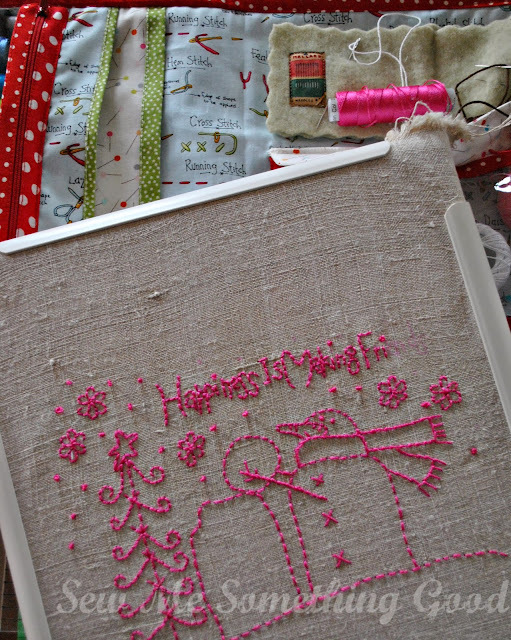 It probably will come as no surprise that I made time to do some more ribbon embroidery. 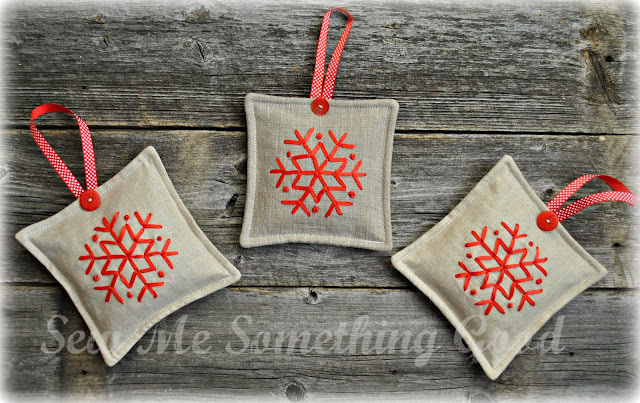 I loved the ribbon embroidery on my gifted spicy snowflake sachets and couldn't wait to do more. 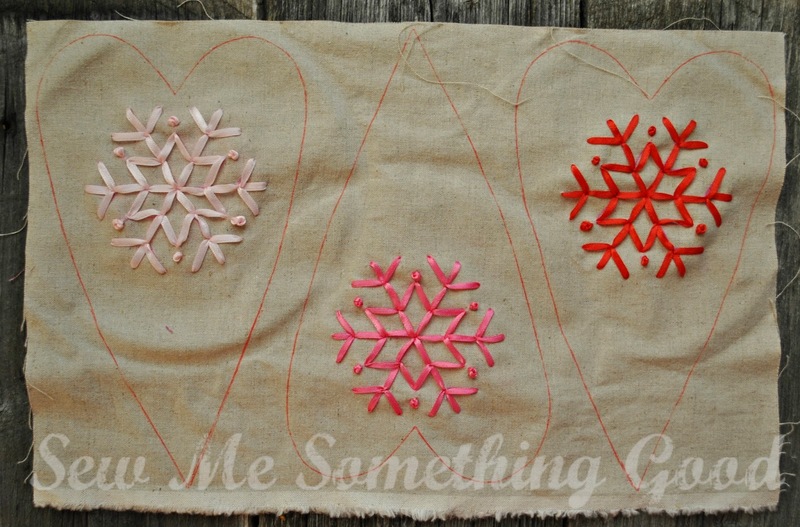 Only this time, instead of embroidering snowflakes on squares, I thought hearts would fun. I mix a blend of several whole spices together to add as fill to my sachets. It's a great way to use bits of cinnamon sticks or nutmeg, cloves or other spices left from baking (or past their use-by date for cooking with). The scent is delicious! The sachets are filled with a mix of spices (I've even added some dried orange peel to my spice mix!) in the middle and some poly fibre fil around the edges (this was to nicely fill out the heart shape). 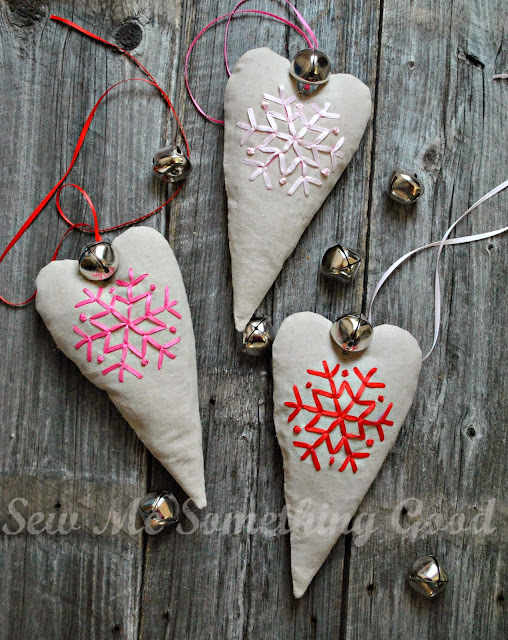 Lastly, I sewed a hook eye onto the top of each heart so that I could thread a length of ribbon for hanging. I thought you might be curious to see how my ribbon embroidery looks from the right side (top photo) and how it looks from the wrong side (photo below). I worked my stitches in a specific order to keep it tidy and not use more ribbon than necessary. If you look close, you may spot the "knots" that make the start of the stitching. Knowing that the wrong side would be hidden, I wasn't too concerned with any twists in the ribbon - but would want to take care if this side was to show. It's funny, but that final, unplanned, detail is the one that makes me smile like crazy. What will I do with these jingling scented hearts? 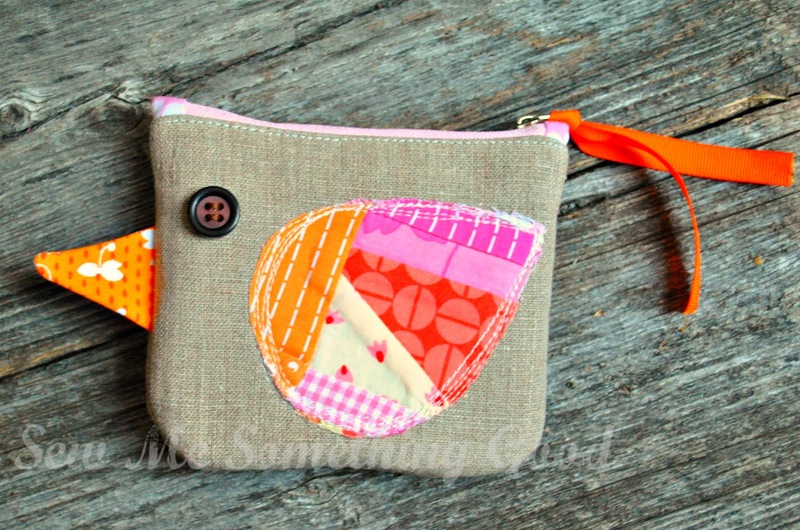 Two things that I never tire of... linen and scrappy patchwork! 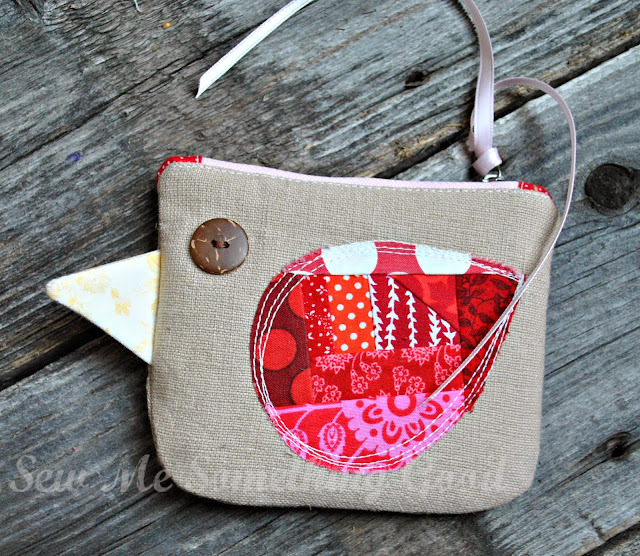 I love the scrappy pieced wings and decided to add a ribbon to the zipper pull as "tail feathers". I love the organic stitching for the attaching the wings to the pouch - so fun to stitch! Such a fun and easy little project, one that is just perfect for gift giving, too. It's a lovely size for tucking a few treats inside (like lip balm and a pretty soap), which now has me thinking I need to make more of these cuties to have on hand. 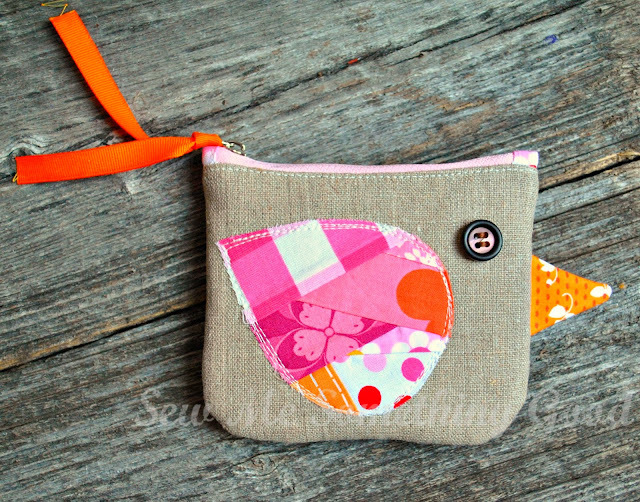 This Kotori bird pouch is the perfect project for using my stash of 5" zippers. 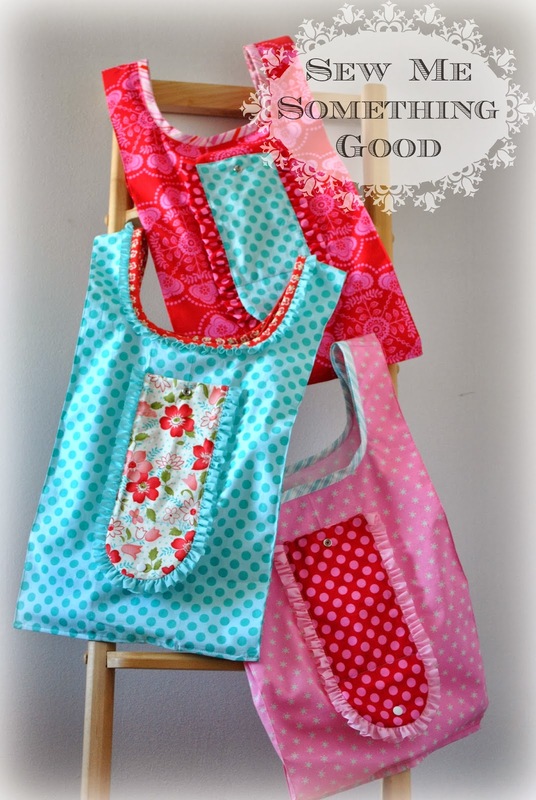 Do you have a favourite "go-to" gift you like to make? I'm enjoying your comments and was delighted to discover the range of years spent sewing from the various comments so far. I'm curious who will be the one with the most years and the one with the least. What a delight! 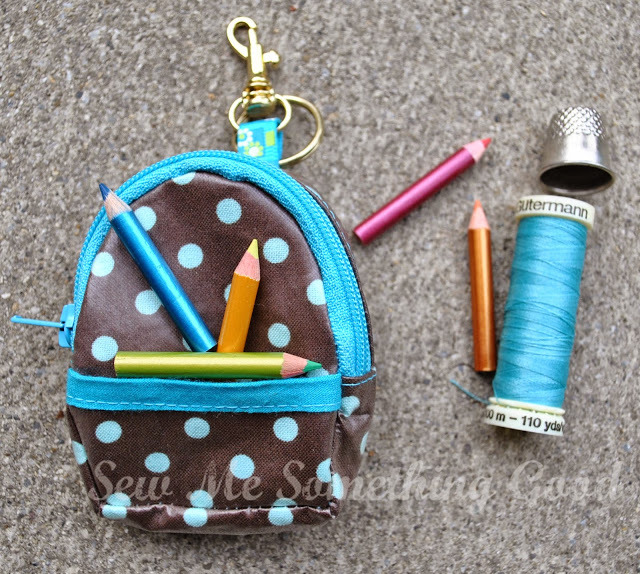 Sewing was not very popular among girls when I was growing up - I was pretty much on my own with my interest. 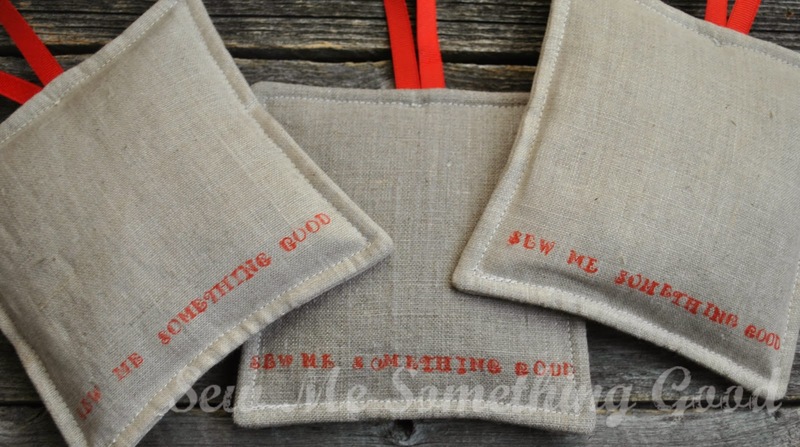 There wasn't even a sewing class taught in my school - although I would order patterns from the home ec. teacher every time a new pattern poster arrived at the home ec lab. The first time I was amongst peers that were into sewing was in college and it was quite a rush to find others to talk fabric and design with. Now, the peer group is beyond measuring - which is quite wonderful. Not only is it great to have others to share and learn from, it's so good to know that this skill is being carried on. 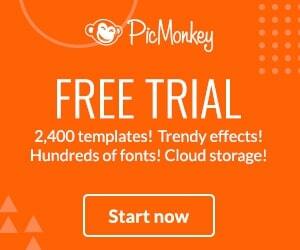 (which actually continues for the whole week because they are so many blogs participating). 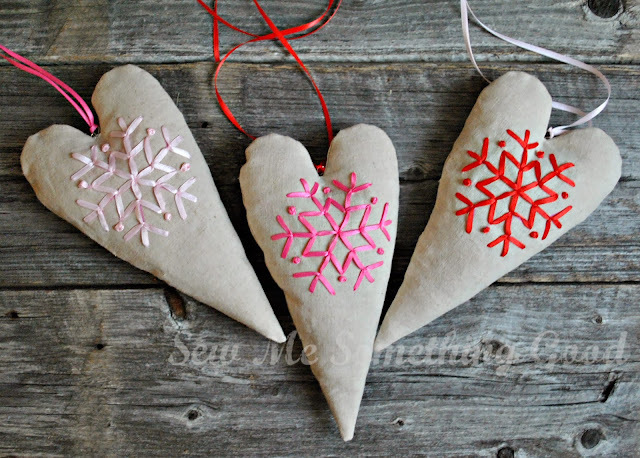 I love Giveaway Day as it is a perfect time to say thank you for visiting my little blog - whether it's your first time or if you've been with me since day one. I always appreciate your comments and love how blogging has connected me with so many lovely friends from around the world. 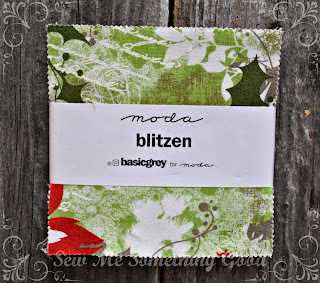 Keeping you in mind, I recently picked up a Blitzen charm pack in anticipation of Giveaway Day - thinking it would work well with the seasonal pillow (Oh, Joy! 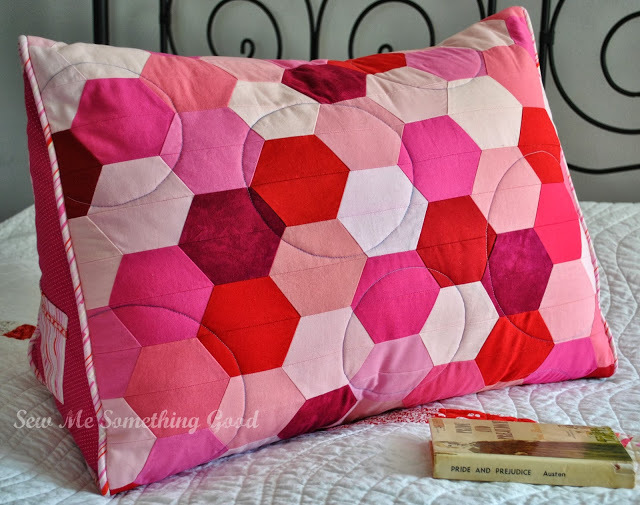 Patchwork Pillow), I designed and have for free on Craftsy, if you'd like a last minute gift idea or something to sew for your own home décor. My giveaway is open world-wide and will close this Friday, Dec. 13th at 5pm PST. A winner will be chosen using the Random Number Generator. In the case of a no-reply blogger being drawn, I will re-draw. I ask that everyone PLEASE put their email address in their comment as part of their entry. In my last giveaway, approximately 30% of my commenters had no way for me to contact them if they won. That made me sad. This led me to think that many of you believe you are not a "no-reply commenter", but in fact... you are. I really don't want you to miss your chance to win, so that's why I'm asking that everyone leaves their email address this time. 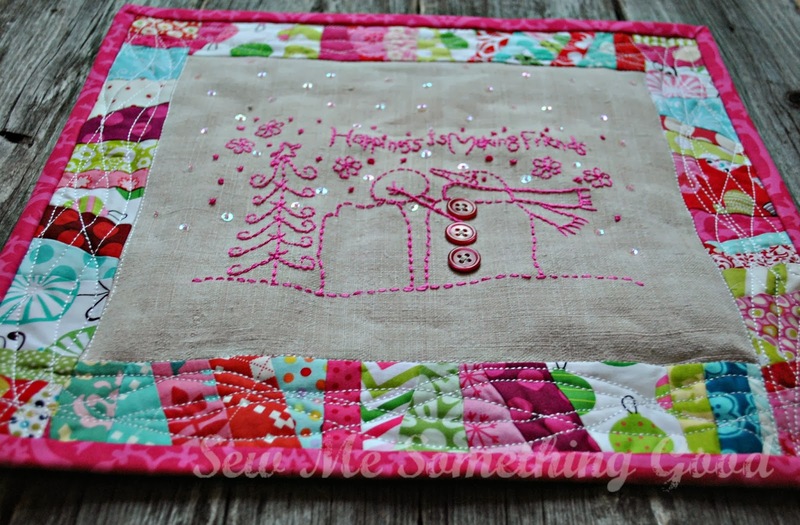 To enter to win, please let me know in the comments, how long you've been sewing. 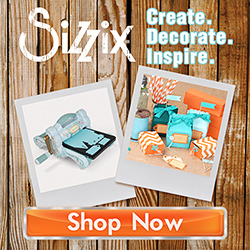 (for the supply category, click here.... for the handmade category, click here). Giveaway is now closed, thanks for entering! 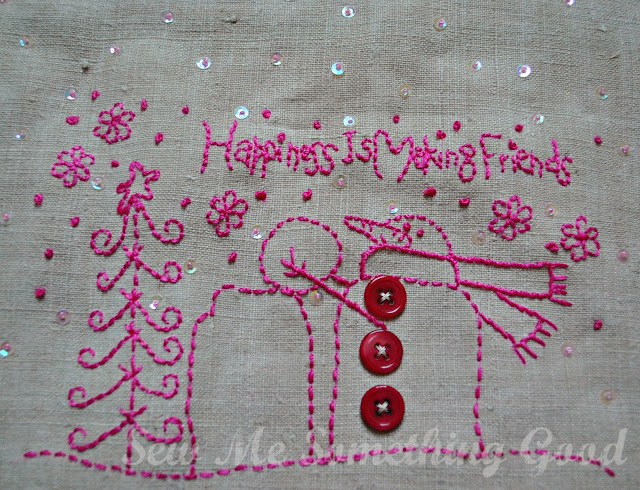 I wanted to show a peek at my progress with my snowman embroidery piece. The other bit of news I had to share is some happy mail I received this week. 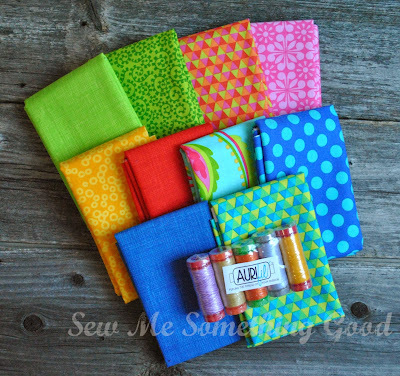 Sew Sisters sent me a beautiful thank-you (for being a hostess on Blogathon Canada), in the form of this bundle of fabric goodness and Aurifil sponsored the threads in matching colours. Aren't they delicious looking?!!! My husband is teasing me, saying that Christmas has come early for me. I think he's right. 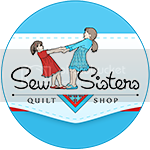 Thank you, Sew Sisters! 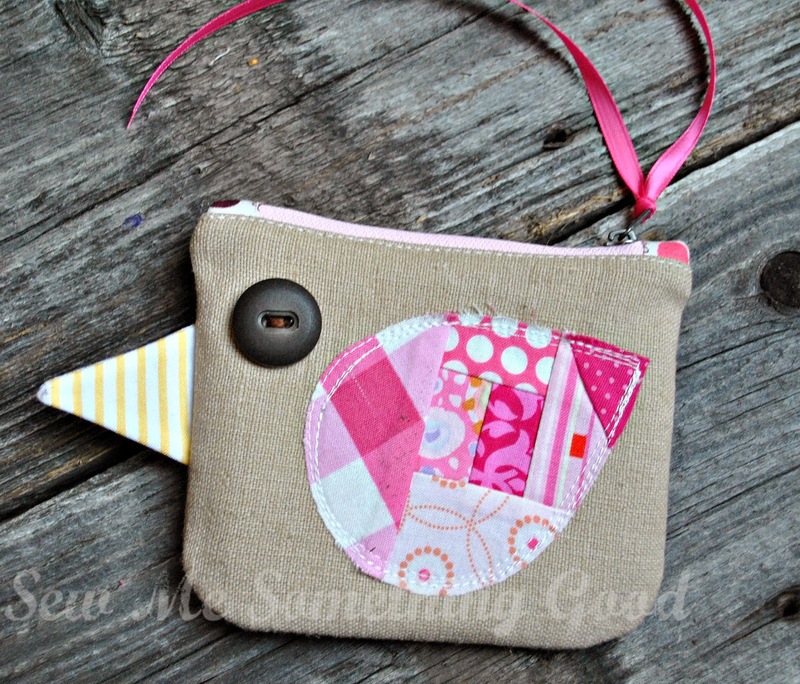 Looking for a quick and cute project? 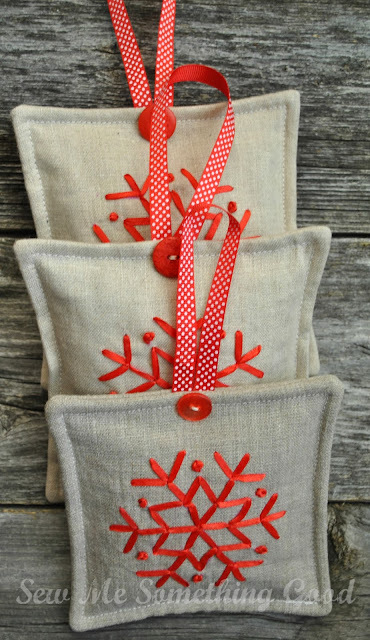 A great gift idea? Then you'll want to try Amy's design for Zakka Pouches from her book, Zakka Handmades. 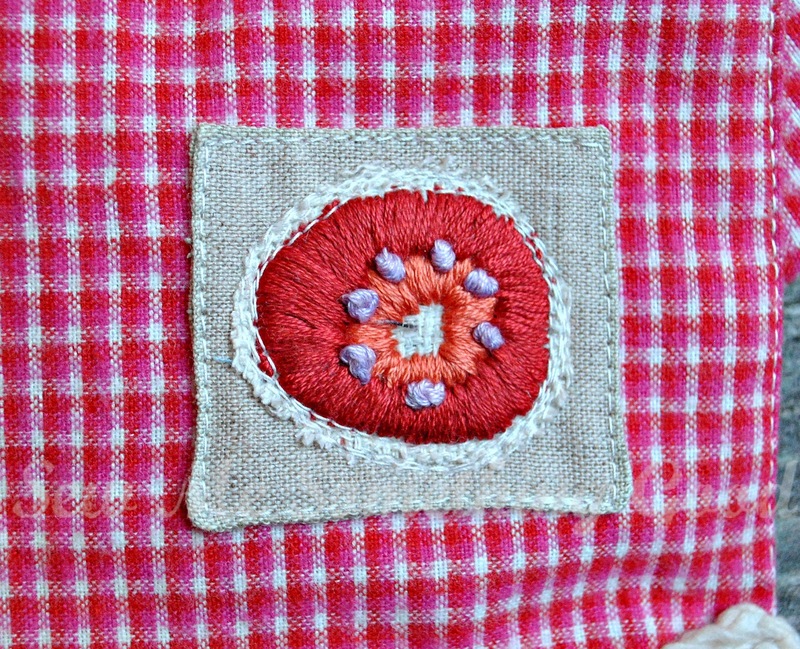 along with a self-covered button. 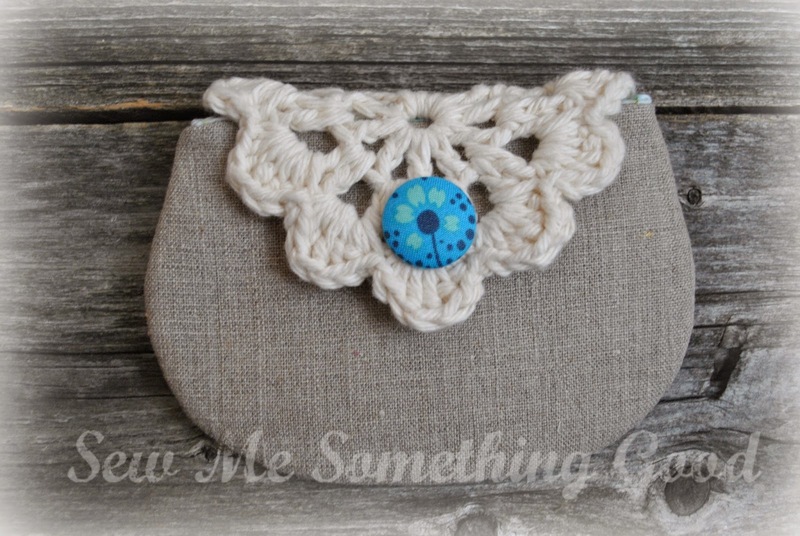 I love the clever design of using a crochet motif for the flap on the pouch. Not too surprising then, that I had to sew another. 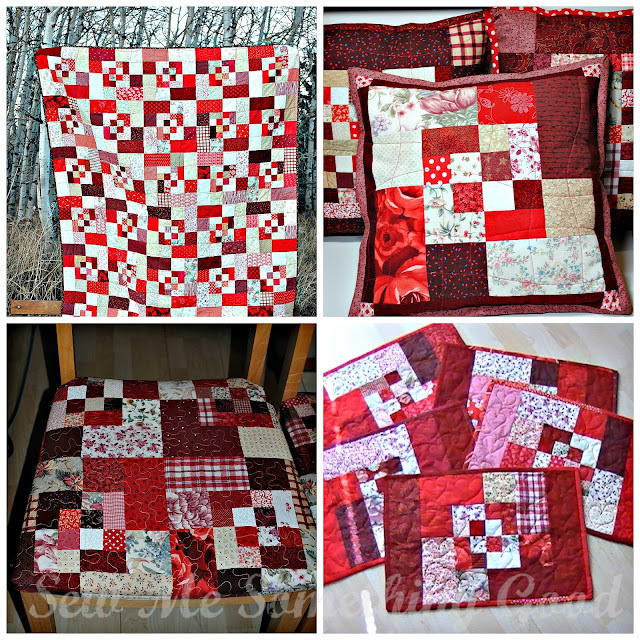 This time using some favourite quilting cottons inside and out. a cotton print for the interior and a fussy cut flower for the button. I now have a sweet trio of pouches ready for gift giving! 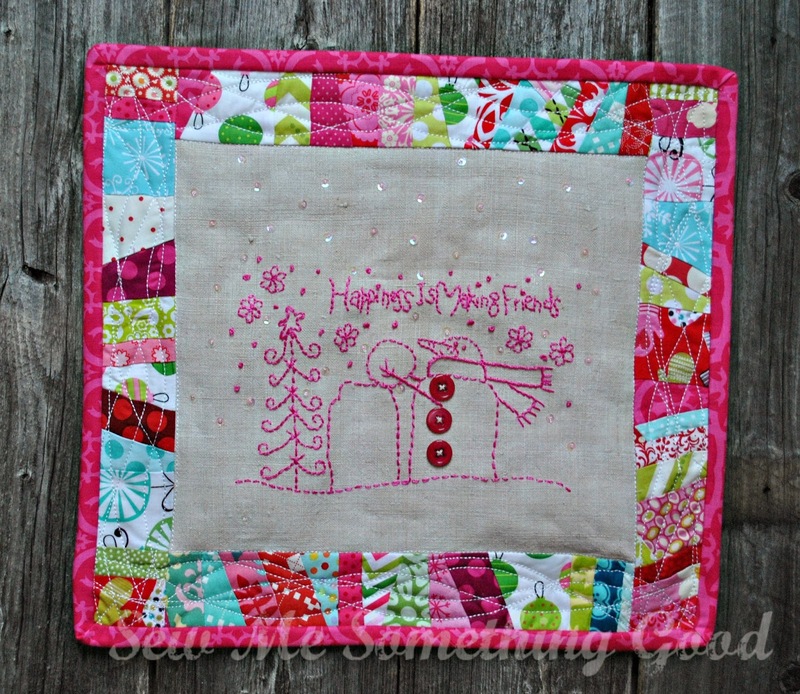 For each of my versions, I used fusible fleece rather than quilt batting. The fleece added just the right amount of loft and a smooth finish, although it does take longer to get it to fuse to the linen than quilting cotton (just be persistent with pressing!). Plus, I found I got better results in positioning the crochet motif by first basting it into place before sewing the lining to the exterior. 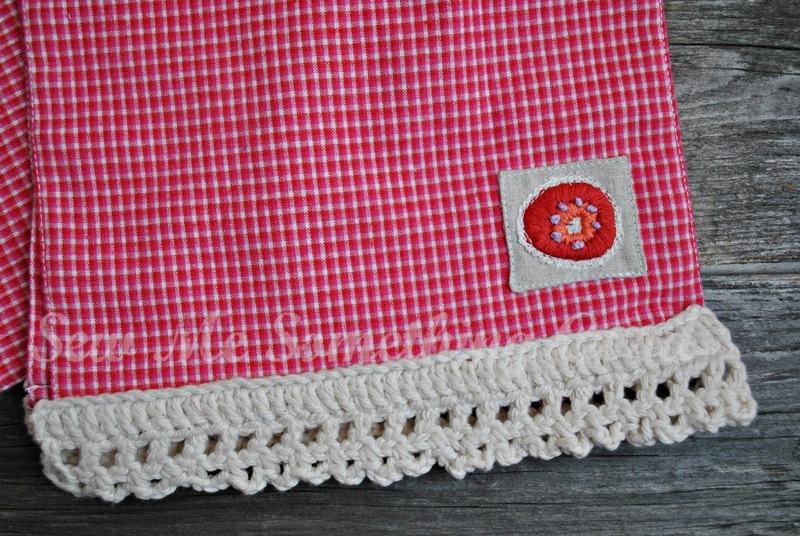 Oh, and the yarn I used is 100% cotton - the kind used for making crochet dishcloths. 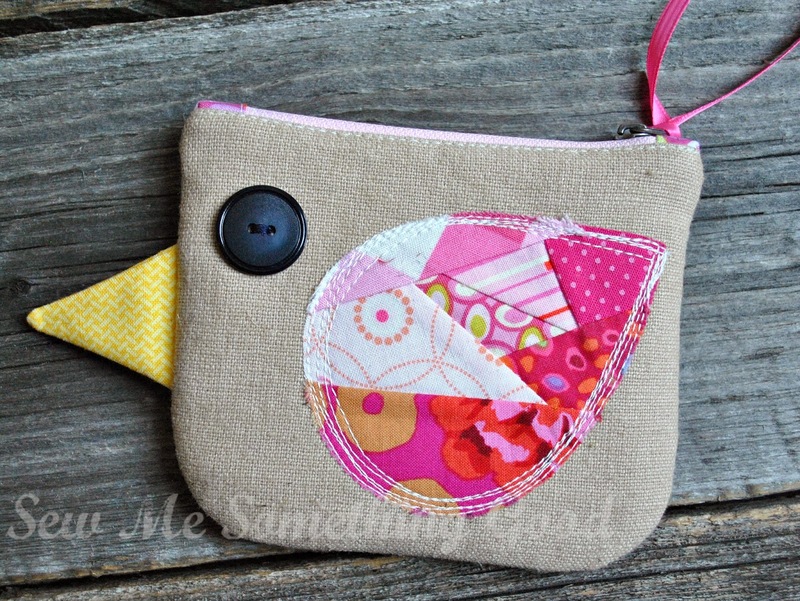 Thanks Amy, for another adorable project in your lovely book! Amongst all the other projects I've got on the go, ahem, (including 2 quilts that need basting), I found myself itching to do some more embroidery. There's just something so meditative about hand stitching and I find I can relax and just enjoy the process of using needle and thread like this. 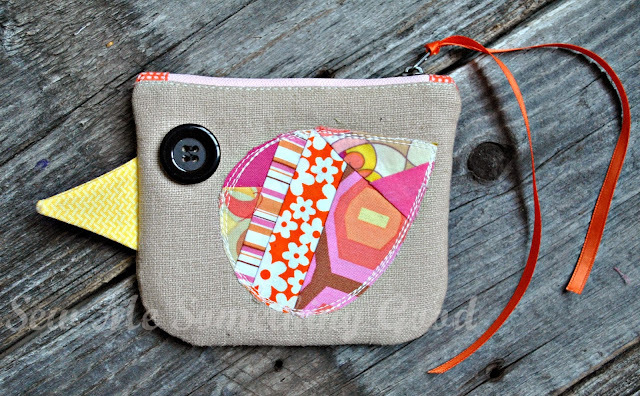 Often, in the midst of stitching I find solutions to other project ideas I've reached a standstill on. 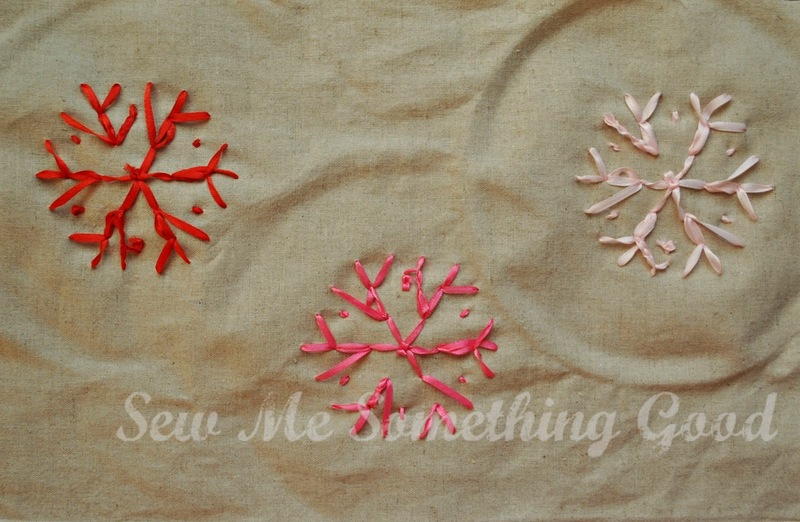 So, I feel less guilty stepping away from things on my sewing list, to indulge myself in a little embroidery project. This is the last bit of a small piece of rustic linen I found a few years back at a thrift shop. It has such an interesting texture that I wish I had more of it. Just a few more stitches and the embroidery part will be done. I'm already considering how I will finish this piece... I'm thinking it's going to need some patchwork. My scrap bin is calling me... but will have to wait until the end of the work day. 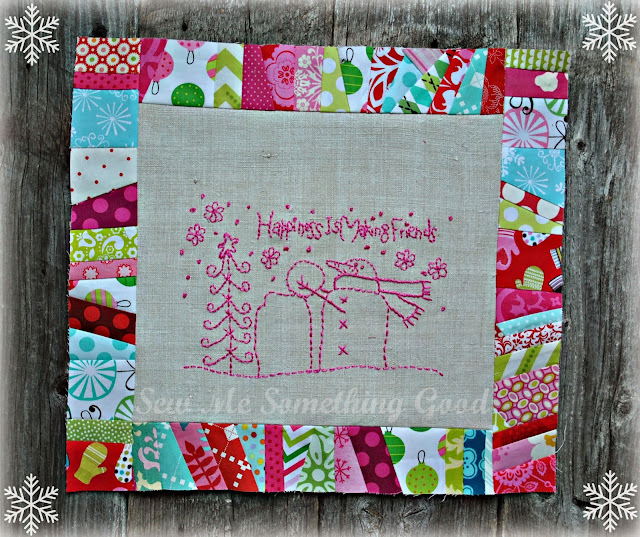 There is one quilt block that I never seem to tire of. I even share a tutorial (here) to show you how to sew your own scrappy bento box blocks. You would think that that would be enough. However, I find myself once again making these blocks. My little portable design board (a piece of foam posterboard covered in white flannel) is set up next to my machine and covered with the cut pieces needed to make more scrappy blocks. Any guesses what my latest blocks will become? Calling fabric loving Canadians...we need your help! Canadian Travelling Stash. 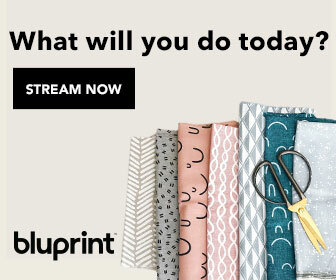 Oh, a travelling box of fabric and sewing goodies that can be mailed to your doorstep? It sounds like such a fun idea, I wanted to spread the word. The rules are that a Canadian blogger receive the box, blog about it, take out and then put in the same amount. 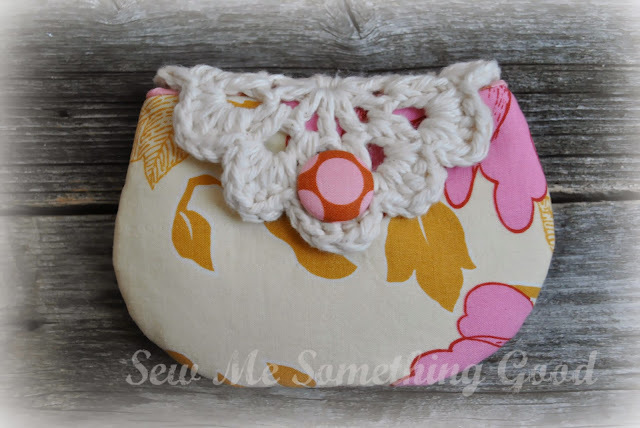 You can put in anything from fabric, to patterns, to thread, or any sewing related items and then you will forward it to another blogger. One modification to the original rules is that the exchange can now be in person (if the next blogger is local to you), otherwise you will be responsible for mailing it. Wouldn't this be fun to pass around one by one to the members of a guild? 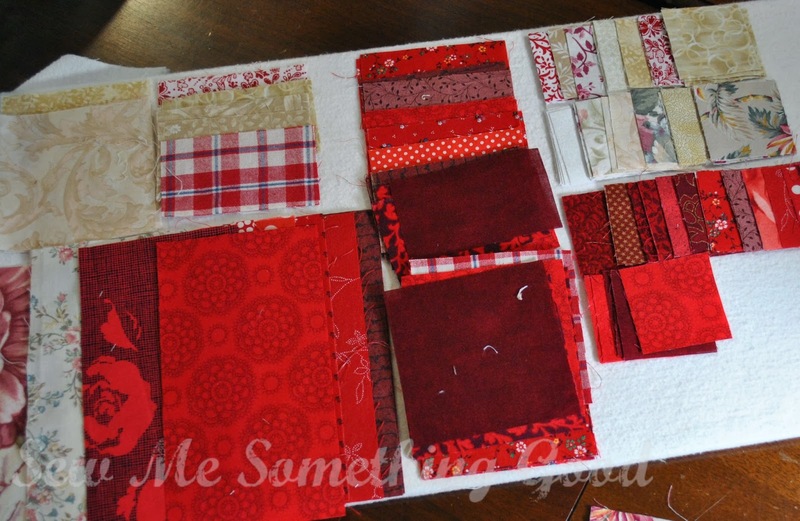 You can click here to visit Denise and see what she has added to the box. Leave her a comment on her blog or here, if you'd like to be the next lucky person to receive the Canadian Travelling Stash! 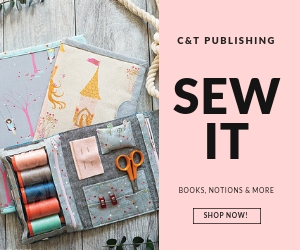 Remember those lovely quilt/sewing books I won last month? 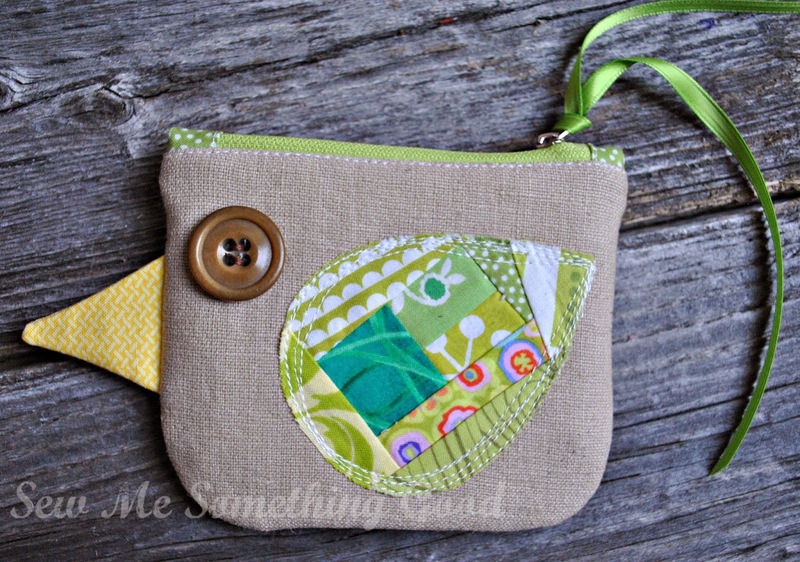 I started bookmarking projects to sew from them as soon as I began flipping through each of them and now I have my first finish from Zakka Handmades by Amy Morinaka. During the time I was sick with a cold, I grabbed this book and my crochet hook and made the edging for this scarf (and went on to make the cherries - which are also in this book - no project in mind for them... yet). The crochet edging is very simple to do - perfect if you're looking for a beginner project to crochet. 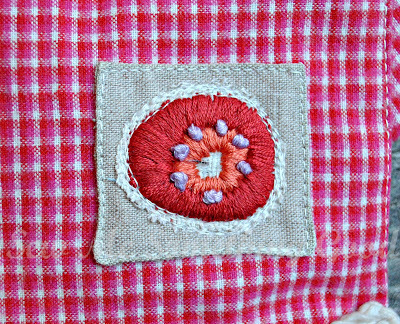 For the handmade tag, I remembered a small embroidered motif I had stitched ages ago, and decided to cut it from its background fabric so I could machine stitch it onto a linen square. I love the results! 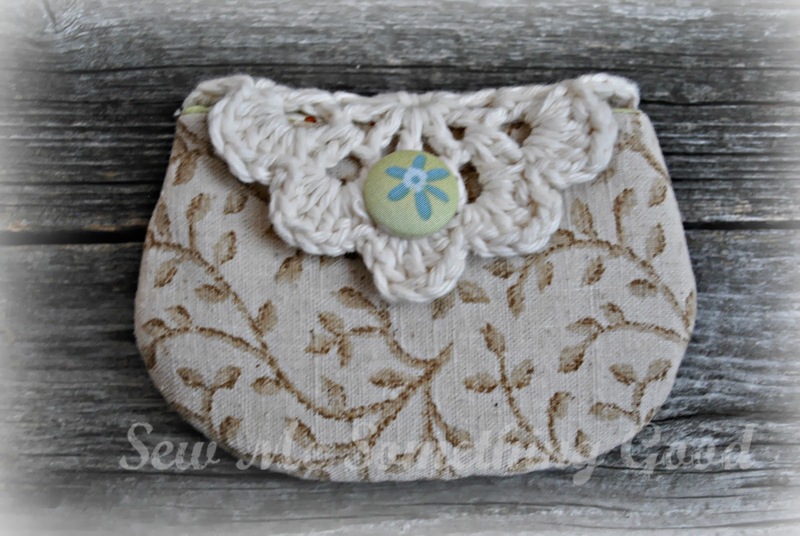 It has the simple, one-of-a-kind, handmade look I was hoping to achieve. All in all, a very straight forward and satisfying project to make. Seems my timing couldn't be better on this finish as our temperatures have taken a plunge since the blizzard blew through here yesterday. 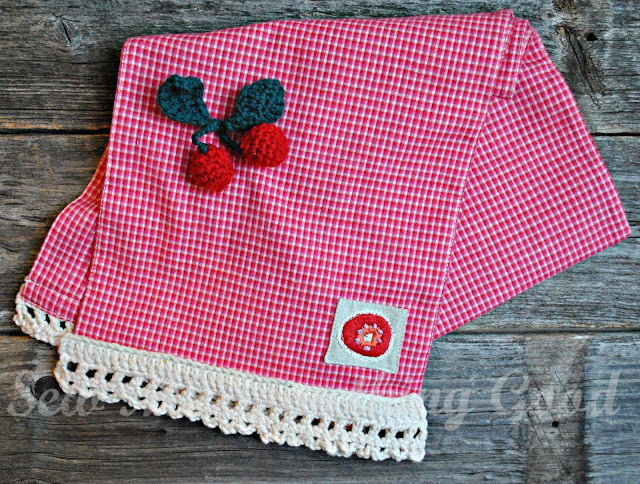 A cozy scarf is a necessity in braving this weather and as much as I love knitted scarves, I'm loving this Zakka version.